Dialogue with My Body: Martial Arts Make You Gentle? Wonder is not how it is but that It is. Martial Arts Make You Gentle? One of the most important factors on body movements based on classical martial arts is to use whole body cooperatively. There are lots of merits to do so, and today I focus on how the state of body influence the characteristics. Think whole body as a company, parts of the body as a number of employees, and brain as the president. If you use only a few parts of your body, only a few employees are working. For example, when you pick up a heavy object, you tend to tense up your muscle of your arms. This state is like this; only a certain employee (=arms) is working and the others are not working. When you want to come to pick up heavier objects, weight training is thought to be a common approach. However, this solution means like this; to make employees who are already working (=arms) work more, but leave the other employees who isn’t work doing so. Is there something strange in it? 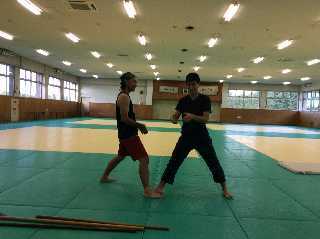 Classical martial arts choose different way; try to make share works with lazy employees and make everyone cooperate. If someone works too much, everyone supports him. If someone doesn’t have job, everyone shares the burden. This kind of company seems to be full of cooperation and have a gentle atmosphere. Same state is likely to happen on your body. If you can use whole body cooperatively, each parts of your body is becoming have a “gentle” characteristics. Therefore, you can become a gentle person by “employing” gentle employees. In fact, some of my acquaintances have changed their characteristics by mastering body movements based on classical martial arts. On the contrary, if you train only some parts of your body, you will “employ” selfish employees who don’t have a spirit of cooperation. Employees rob jobs each other, and the president put a few employees who assert themselves strongly in this “company”. This kind of company (=body) cannot produce gentle atmosphere. Which company (body) do you want to have? I must choose gentle one. Martial arts are thought to be violent, but it can help us to make a “gentle body” by using a whole body cooperatively.